This year's Oscar ceremony was, while thin-feeling and almost haphazard, a sparkle nonetheless and also, completely uplifting. As the night unfolded, we witnessed countless surprises. We saw moments of sweet witticism and grace. With such a plethora of newcomers taking the stage, gratitude stole the evening, and even old friends to the handsome, gold statue came through with touching words of encouragement. I'm not sure I've ever seen so many winners reassure an audience that with the right kind of unyielding hope, anything can be done. Dreams of any level can be reached. I think of Javier Bardem in Spanish conversation with his mother, Marion Cotillard thanking love and life, Tilda Swinton's utter incredulity, and Daniel Day-Lewis's soft-spoken, humble words that seemed to fall from his mouth like rain. All of these things, even during a ceremony of too many montages and almost zero spectacle, made Oscar Night 2008 wholly satisfying to a girl like me. I like underdogs, and I like whimsy. I enjoy invocations of hope, especially in a place like Hollywood, which has a seething reputation for killing things like hope, and for once, I enjoyed a vast and spacious lack of politics, of any kind, on the stage, in the crowd, in the ballots, and in the mouths of stars. I think that, after a year like 2007, which saw the box office failure of several Iraq war and current event films (Rendition, Lions for Lambs, and critically acclaimed films like In the Valley of Ellah), film audiences of all kinds, even those that comprise the Academy, made it perfectly clear: Less war, more whimsy. Juno showed us that much, and it was rewarded with four nods and one (big) win during last night's ceremony. Of the five films nomin ated for Best Picture, none of them had anything to do with true events, three of them were novel adaptations, and one was a comedy about a teenager. Zero biopics. Zero message films. Zero life's works. All from directors that are NOT old and crusty--those who deserved Oscars twenty years ago but receive them now from an Academy that must make up for a previous Academy's poor judgment. The one thing I can say for them all is this: they're art. I've never seen a more pain-stakingly literary film than There Will Be Blood. Juno is relentless in its dialogue, hopelessly modern, deftly un-romantic, yet completely sweet. Atonement is a sheer achievment in vision, one of the greatest adaptations I've ever seen and of a seemingly unadaptable book, no less. No Country for Old Men is, without a doubt, a personal best for the Coens (though I still believe their best is yet to come), who lifted a screenplay from the words of Cormac McCarthy and handled it with incredible mastery. And finally, Michael Clayton is a work for its actors, a chance to remind us all that great performances still exist, and that they don't have to be steeped in the poo of s pectacle to gain notice. For so long, the Oscars have been a breeding ground for celebrity ego, massive glitter earrings, and speeches that invoke agenda. But last night was about the art. We heard celebrities pain over their art, greet it at the podium, thank it like a gracious child. I'm SO SICK of art for anything other than art's sake, and I think that, during a year when we're sick of a war, sick of so much time being demanded by tragedy, a little bit of ''l'art pour l'art'' is a good thing. I'm glad to have had film regarded as an art last night rather than as a vehicle for politics and cash. This type of thing is encouraging to me, because when I write film, I write it because I love it, and there's nothing that pains me more than when someone, writer, actor, critic, whoever, belittles that love by placing it below their agenda. Notes on a Carbon Cate: For sure...I'm not the only person in the world who is sick of Cate Blanchett. How many times can you be acknowledged as mean-Galadriel or Invisible History Girl until people start craving something else? Yeah, she's got conviction, but I, personally, would like to see more turns like the one she gave in last year's shocker "Notes on a Scandal." No more disappearing acts and magic costumes, please. We want some for realsies roles. The kind that come unadorned and sans the majesty of make-up and wigs. Day for Day: Day-Lewis's win for There Will Be Blood also came to no surprise late last night. His humbling speech struck such a contrast to the role he gave it for that I, for one, felt prickles on my neck and a tear on my cheek. It's a terrifying reality that such a quiet, handso me man could unleash a monster like Daniel Plainview. This proves that movies still have the power to reveal things not only of their characters, but of their audience as well. As you can read in my earlier review, I've spent nights, I've spent days, I've spent way too long pondering the literary gravitas of There Will Be Blood. Much of it has made me rethink the idea of coincidence as a whole, and, well, it's rendered me utterly IMPATIENT to get back to school in the fall. For now, however, I plan to become obsessed with Day-Lewis for the next few weeks as I watch and rewatch the entirety of his works. Paul Thomas Anderson as well. I've analyzed Boogie Nights more times than necessary; however, I could always use another viewing of Dirk Diggler's legendary....member. No Country for Anything Else: Sure, the awards pretty much scattered like shrapnel, but a good chunk of them went, as wholly expected, to the Coens. Even still...when it came to Best Supporting Actor, while I can't say I was surprised by Bardem's win (nor was I disappointed), I was left a little unsettled. I liked Javi in No Country, but I didn't like him as much as I liked Tom Wilkinson, and even as much as I liked Tom Wilkinson, it turns out that (gasp) I didn't quite like him as much as I liked Casey Affleck. Call it a crush, but Casey has chops. 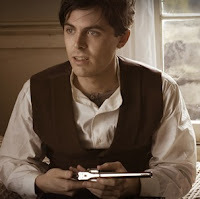 His creepy, unnerving rendition of Robert Ford haunted me well after the movie had flickered to credits, and that's saying a lot, because as a film, The Assassination of Jesse James by the Coward Robert Ford is about as long and gratuitous as its title, and the only part that truly registered with me was, well, Casey Affleck. He was good. At LEAST as good as Javi Bardem. But whatevzies. He'll walk that stage once or twice in the future, I'm sure of it. Anyway, the Oscars were fun this year. They felt a little undercooked, to be expected, of course, as the writers guild barely had time to catch its breath before show time. Jonny Stewart was, as always, priceless, whether he garnered crickets or stole our hearts. I enjoyed it, though I did have one large criticism. What happened to the Best Picture nominee montages they normally use throughout the show? I always look forward to those montages, and for whatever reason, they were dismantled this year. Oh well. To be honest, now that it's over, all of it feels so strangely insignificant. I'm too busy looking forward to this year to care. And I can only hope that 2008, as a year in film, will somehow come close to the skill, command, and, not to mention, whimsy (of course) of 2007. Peace.